Cinematic Progressive-Rock. 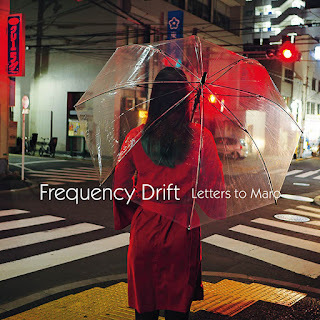 Frequency Drift and Letters to Maro. This is their most direct straight to the point work up to date, yet they've painted a landscape which you could walk around in its vivid structure for hours and hours. Hell. You would probably get lost in the woods along the way and finally wander off to the nearest pub. It's not exactly top-twenty easy-listening, there's no easy and direct path. You definitely need to spend some serious leisure time with the compositions. All this in mind I really enjoy their atmospheric art/prog-rock. The angelic voice of Irini Alexa and the eletronic harp, definitely at the centre of attention throughout the album. Stunning and haunting vocals which might just remind you of the way Mike Oldfield used to work with female singers in the eighties. Throw in tiny bits and pieces of Toyah, Kate Bush, Fiona Apple, and you're closer to home. Expect layers and layers of backing tracks and beautiful vocals on display. Dimensions of sound that are as complex as they are experimential, Alexa uses her emotional eloquence in her voice as well as song writing style on 'Letters to Maro'. Do however not expect to find many or any headbanging prog-metal moments on this record. Nope. It's more towards the magical, mediveal, atmsopheric, folky-kind-of prog and for instance, "Neon", borrow quite a lot from Oldfield and Nerissa Schwarz (Sythesizers, harp, mellotron) seems to be a major fan of the man. To make things simple and not always 100% correct. Think Oldfield - not Dream Theatre. The strength of the album, there are no real downers nor massive uppers for that matter. The music is soft and not far off pop music on several occasions. It's the proper album effort and you can easily enjoy it without skipping tracks. Recommended.